As readers of this blog probably are aware of by now, me Alexander and Erik AKA Nordic are planning a Path to Glory campaign using the new rules for AoS. (Rules which can by downloaded from GWs site for a measly 4 quid). I chose The Architect of Fate as my deity because I felt Tzeentch is a rather unrepresented but very interesting god. Being the convertion nutter I am I will have ample opportunities to create lots of mutations and weird gribblies. I am starting my warband from scratch, so it will be an intense time ahead to get everything done in just about three months! Crown of fingers mutation for one of the coming knights. 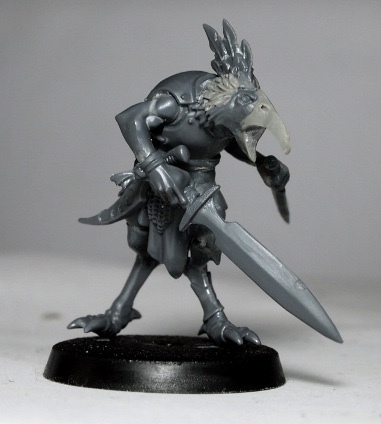 Birdfaced ungor made from a clanrat with feathers from dark eldar scourges and legs from a daemonette. sword from vampire counts skeletons. Ungor with head from corpsecart and helm from VC skeletons. 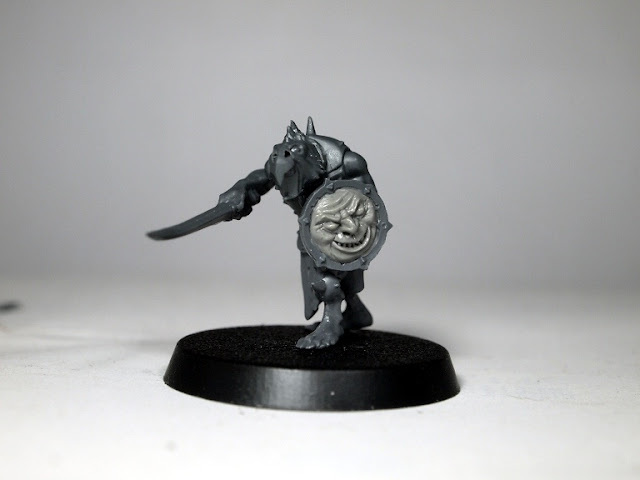 Another birdfaced ungor with sculpted face on the shield. 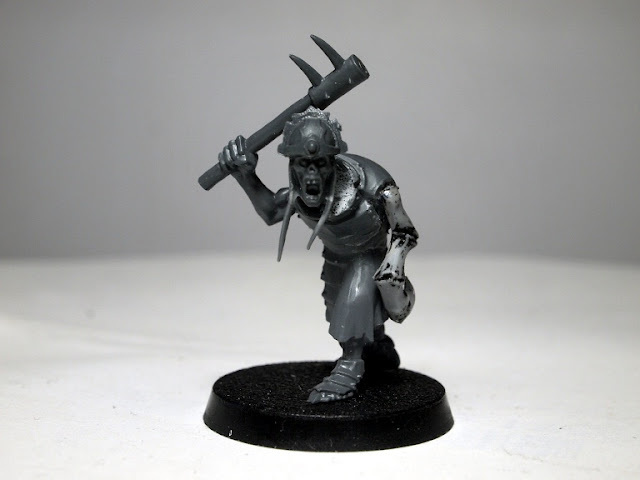 A goblin made from a hobbit goblin with grot face, flagellant mace and the foot is from the chaos warshrine ogre. I will make five more count as ungors. Just to show something painted. 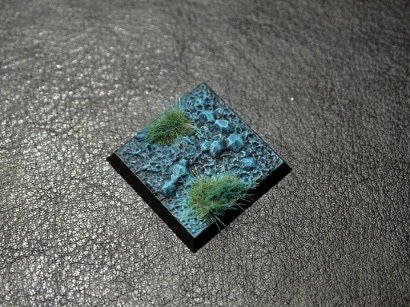 here is a color test on a base. That's the start of my warband. Now I'm eagerly awaiting the arrival of new bits so I can start working on my knights! Thank you Nordic for this insight into your process. We'll soom be back with Alexanders warband dedicated to the Prince of Pleasure. Stay tuned! 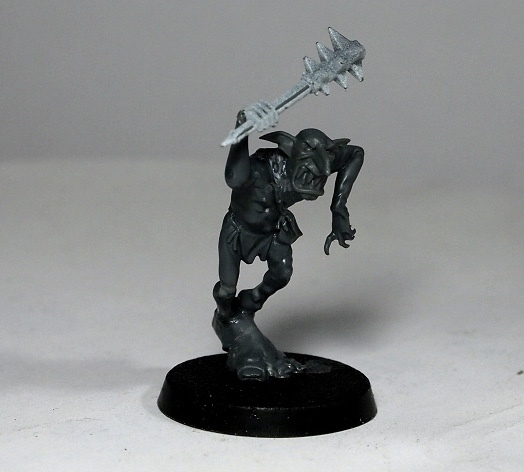 I really like those goblin conversions, especially the one with the skull cap, it's a really dynamic pose. Great models! I love the Goblin. 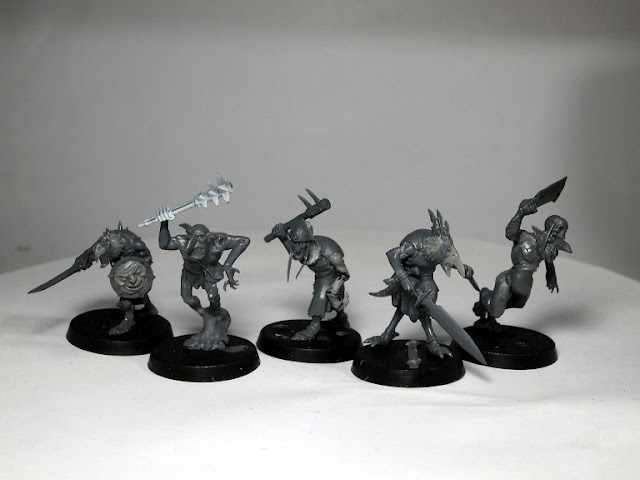 As you know, the old horror sculpts seemed a lot like goblins (lips, mouth, cheeks, long nose, the big hands...), and because of that you can use grots to convert demons without losing the coherence. 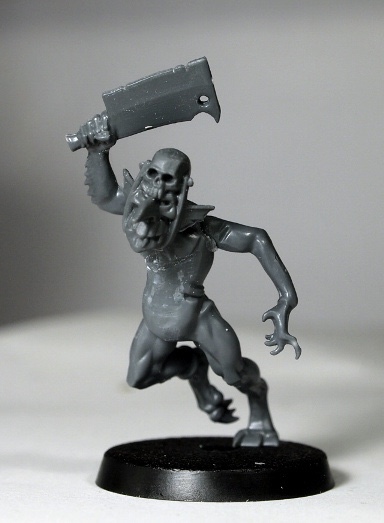 In fact, recently I ordered this goblin king on a shield http://www.warseer.com/forums/attachment.php?attachmentid=120929&d=1319438531 in order to build a demon-sorcerer on a little tzeentch disk, with a demon familiar below. Anyway, I wanted to ask: Where do we find bird faces? The ones I've found are too big. Thanks in advance. the bird faced ungors are just clanrats. I shaved down the nose into a beak, i saved the teeth to make them the point of the beak. then i drilled holes for the nostrils. For the bigger birdguy I enhanced the beak with a bit of sculpting. These guys look fantastic. All the conversions are subtle, such that those unfamiliar with the models would not even know they are not stock; the best sort of conversion. I love the pink horror goblin, you showed me there is a good use for the plastic pink horrors (I thought the plastic horrors were a major step down from the metal ones)! 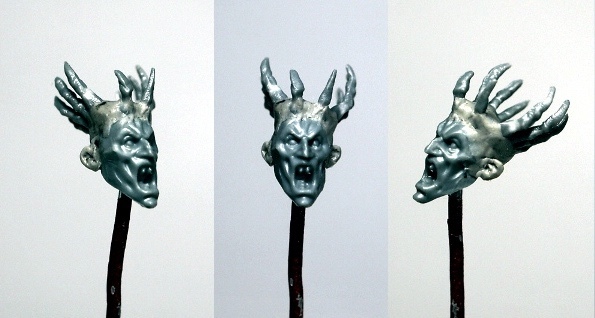 The little face you sculpted on the shield is marvelous, truly of the Realms of Chaos era. I also really like the finger crown, and cannot wait to see the knights. Keep up the stellar work! Thank you, I am of your opinion about the horror models. I really don't like them as horrors go but they're great for converting, same with the daemonettes really. Some cool conversions here. I really like bigfoot, but the birdfaces is on another level. Amazing! But my favorite part has to be the fingercrown. Feels very old school and RoC but with new cool parts. Keep it up Nordic! Very much liking the dedications to the Changer on these. I know, it's eerie. I accidentaly made a joke about steve jobs the day after he died, I didn't know he had passed away the day before and I said "death to apple". Birdfaced ungors are awesome ! I'm not sure about the gobs... maybe once they'll be painted. Nice choice for the base too ! Wow. i love those guys, esp the Goblin with giangantic foot! its really interesting to see which miniatures you are cutting and how you put them together. I will have to keep growing my bits box! I also really like how its a modern take on the Realms of Chaos books. Bird faced Ungors? No problem! Chaos goblin with mutant foot? You betcha!